Not too long ago, I had the opportunity to take a really fabulous trip to Atlanta, courtesy of the City of Atlanta. Among the highlights of the trip was all of the amazing food that we ate. 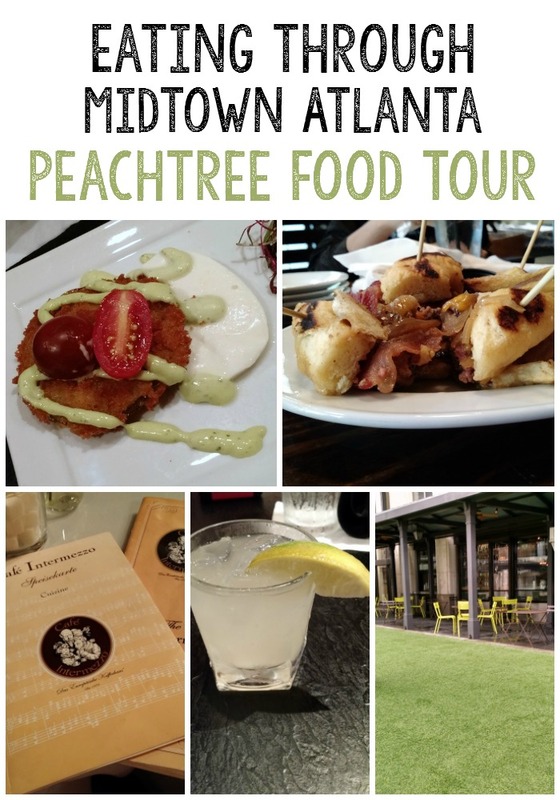 I was lucky enough to spend a fabulous morning on the Peachtree Food Tour, which winds through Midtown Atlanta. John, our host, was full of great tips about not only the restaurants, but the history of the area. Midtown Atlanta is jam-packed full of great food, but only a small handful of shops. It’s also home to historic places like the Fox Theatre and Margaret Mitchell House, Savannah College of Art & Design, and Georgia Tech. 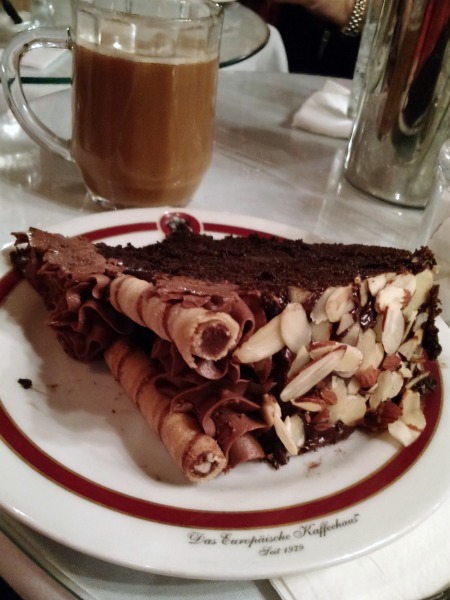 We started off at Café Intermezzo, which is a dessert hotspot. There was a distinctly European vibe that you could feel as you walked up. And when we entered, we were greeted by more desserts than I had ever seen in one place. 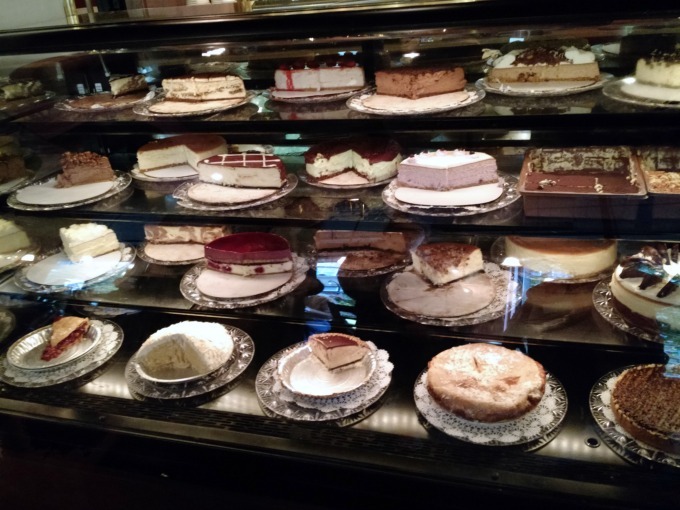 There were two huge display cases that were loaded with cakes, pies, and tortes. OH MY! This is just part of one of the displays. Once we arrived at the restaurant, we learned what we were really having. 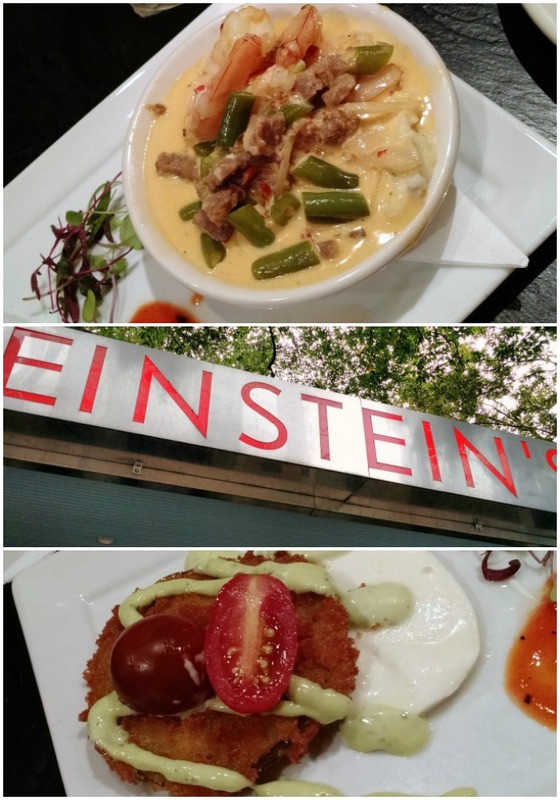 It turned out to be Shrimp and Grits and Fried Green Tomato – a couple of southern classics! The shrimp and grits had a bit of spice, and some fresh green beans. Those were both a nice modern take on the classic fare. The fried green tomato was like a southern twist on a Caprese salad, as it was served with fresh mozzarella and basil aioli. 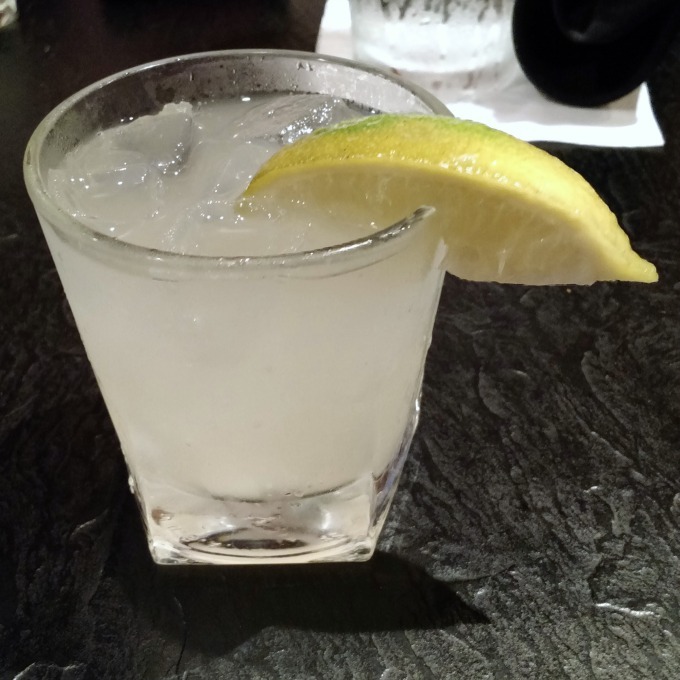 This was topped off with a Georgia Mule, which had honeysuckle vodka as one of the ingredients. So good, and it was the perfect complement to the food. Onward we walked, stopping at various spots to learn more about the area. We stopped by the Margaret Mitchell House, and heard the history of it. 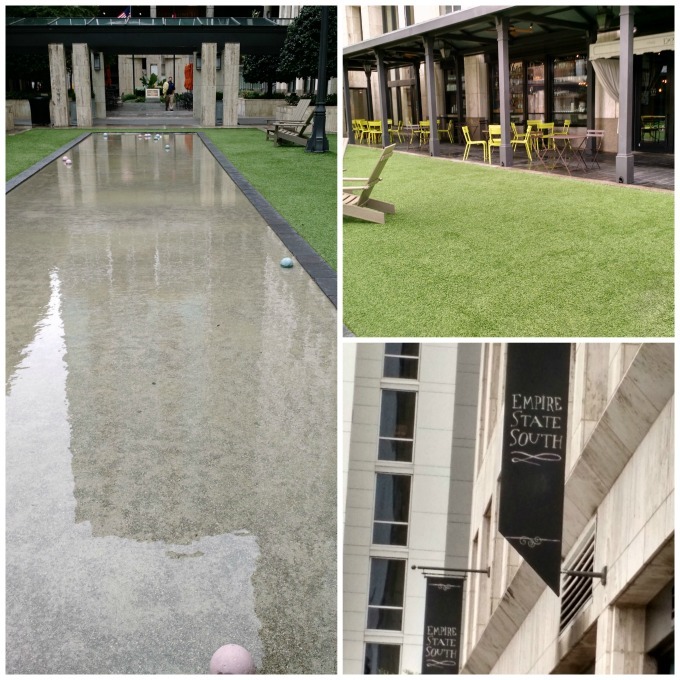 We learned about some great people watching spots and places to have a fab cocktail. One of our stops was at Empire State South, which is one of the restaurants in famed chef Hugh Acheson’s portfolio. We didn’t eat there, but poked around on the grounds, and considered playing a game on the restaurant’s bocce ball court. I mean, it was only slightly flooded and no one was there at 9:30 in the morning. Who woulda known? Empire State South used to be a stop on the Peachtree Food Tour, but no longer is, due to time constraints. It’s still a highly recommended stop, though. We hit our next stop, which was Cypress Street Pint & Plate. This is a wonderful little gem that looks like a sports bar on the outside, and near the GA Tech campus. But it’s NOT a sports bar. In fact, they really don’t want you hanging out all day to watch a game. They’re committed to local foods and local causes, which is always a bonus. It was here that we had the Sublime Donut Burger paired with hard cider. OH. EMM. 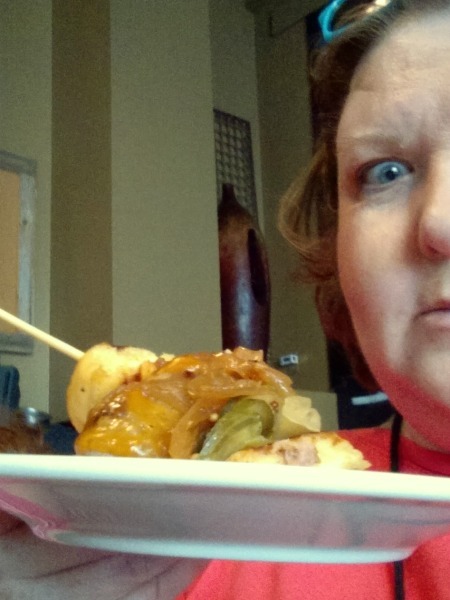 GEE…I totally understand why this burger placed second in the 2013 World Food Competition. The donuts, from local bakery Sublime Donuts, were light and sweet, but not too much, and they weren’t greasy. Factor in the good quality bacon and nicely aged cheddar, and this was a total highlight! It was paired with a hard cider that really just made everything that much better. 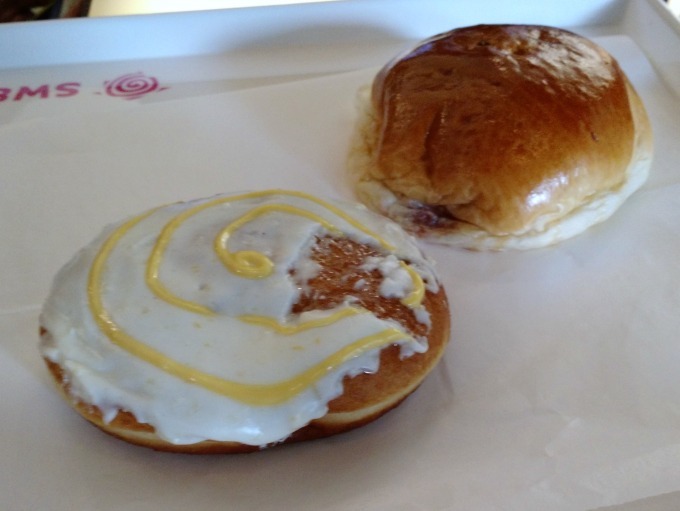 As we started working our way back towards our home base, we stopped at an Asian bakery called Sweet Hut Bakery and Café. They had great cases full of fun flavors of baked goods. We took these back with us to have later. Forgive my missing frosting, as I am apparently incapable of choosing goods from bakery cases with tongs. 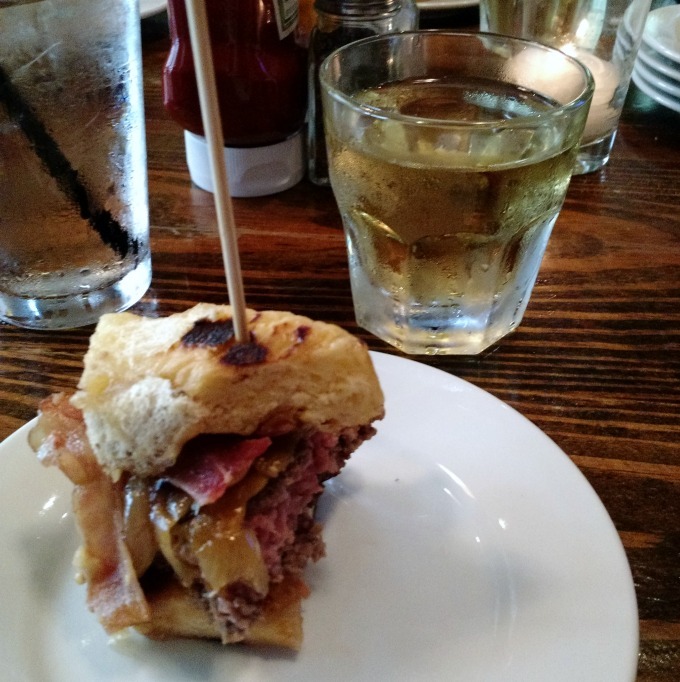 If you ever have a chance to take the Peachtree Food Tours, don’t hesitate. John is an absolute delight, and his number one goal is making sure that everyone’s having a great experience. He keeps everything fun, and moving along with the right mix of anecdotes and history, with a healthy dose of food and culture. Peachtree Food Tours also works with the restaurants to take your special food requirements into account. There’s a reason it’s the #1 food tour in Atlanta.